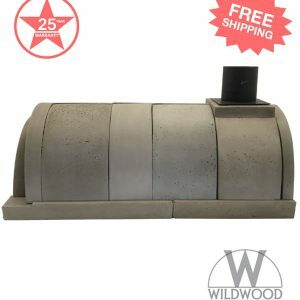 Wood Fired Oven Kit – Buy Now And Get Free Shipping! Our Roma wood-fired oven offers big performance in a small Footprint. If all you want to do is cook the best-tasting pizza in a limited space, this oven is for you. Great for indoor installations with limited space, this professional grade wood-fired oven heats up fast to 900F in an hour or less. Cook authentic Neapolitan pizzas in 60-90 seconds. This oven takes up about as much space as a built-in wall oven. Now you can have it all! Wildwoods Roma wood-fired oven is the perfect compromise for the chef who wants to install a genuine wood-fired oven but doesn’t have the space necessary to construct a large oven. Wildwood makes it easy to build a pizza oven. Made from Wildwoods proprietary refractory concrete formula which uses “HEAT PILLOW” technology. These “pillows” act as tiny sponges to absorb and hold heat for hours, thus improving the performance tenfold! The Roma is based on the ancient ROMAN style tunnel ovens and has a footprint of only 30″ square, perfect for 2 – 8 ” pizzas or 1 -12″ pizzas. Want to make loafs of bread? No problem, This authentic wood-fired oven will give superb results. It can be installed easily indoors and will fit most countertops. 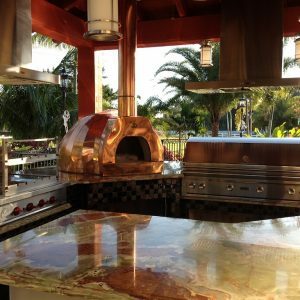 If you don’t have a wood-burning pizza oven in your home or outdoor kitchen… what are you waiting for? If you are looking for a real wood stone oven look no further. Visit our Los Angeles showroom and see for your self! Bake up to 4 Pizzas at a time. Pizzas cook in 60- 90 seconds. Bake up to 7 Pizzas at a time. Pizzas cook in 60- 90 seconds. Made in Los Angeles, we welcome you to stop by for a test drive to see for yourself how fast the oven heats up and how well it performs. Wildwood Ovens wood fired oven kits are the perfect choice for the chef who wants to install a genuine wood fired oven but doesn’t have the knowledge necessary to construct a large oven. Wildwood makes it easy to build a pizza oven. 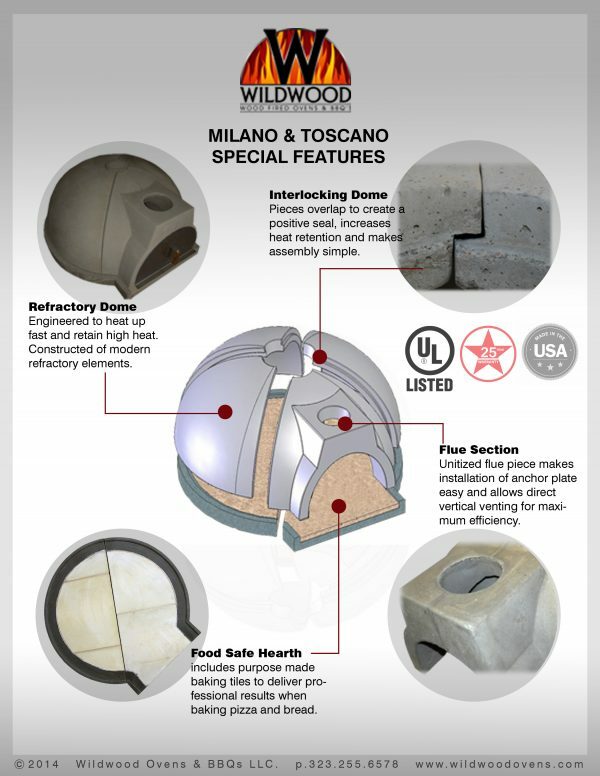 Made from Wildwood’s proprietary refractory concrete formula which uses “HEAT PILLOW” technology. These “pillows” act as tiny sponges to absorb and hold heat for hours, thus improving the performance tenfold! 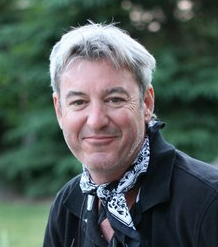 Michael Gerard created Wildwood Ovens out of a passion to cook the best tasting food over wood. During his pursuit he has installed over a thousand Wood Fired Ovens, Barbeques, and Grills. He shares your passion for creating the ultimate wood fired kitchen. Give him call to discuss your kitchen. What makes Wildwood’s wood fired oven kits the best? Our unique interlocking dome design represents years of careful research. Every aspect of fuel efficiency, firing consistency and durability has been incorporated into each Wildwood wood fired oven kit. There is no other pizza oven design that can provide such an unparalleled performance. Our pizza ovens heat up extremely fast, reaching 800 degrees F in an hour or less, and have very low wood consumption. we are currently offering Free Shipping on all our oven kits (up to $400 value)! 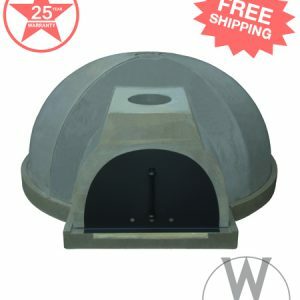 OVEN SHAPE Dome shape is precision engineered to heat up fast (900 degrees F in 1 hour), retain high heat and weather soundly. Constructed of modern refractory elements. INTERLOCKING DOMES 3-1/2″ thick dome pieces overlap to guarantee a positive seal, increase heat retention and makes assembly simple. FOOD SAFE HEARTH Includes purpose made baking tiles to deliver professional results when baking pizza and bread. CHIMNEY SECTION Unitized chimney piece makes installation of anchor plate easy and allows direct vertical venting for maximum efficiency. 25 YEAR WARRANTY Our professional grade, Wood Fired Pizza Ovens are covered by 25 year warranty against defects. Warranties that are more than 10 years old are generally pro-rated, which means that for every year you own it, you would receive less and less credit. If you discover a defect, just email us or give us a call and we will go from there. 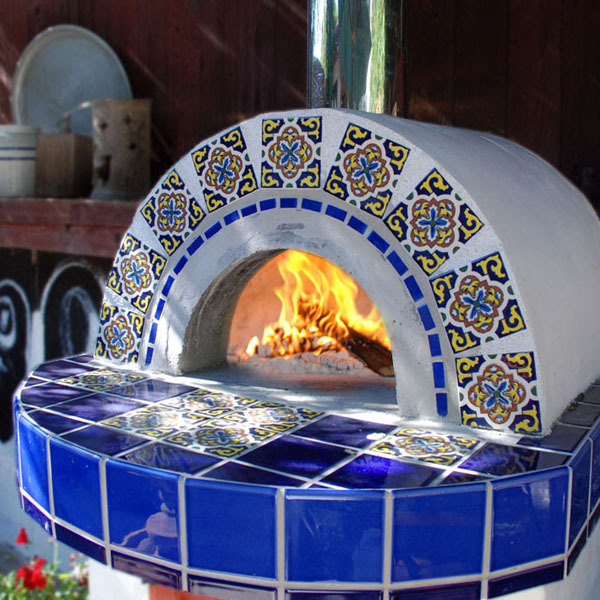 MADE IN USA Our Wood Fired Pizza Ovens are manufactured in California. We are a group of individuals passionate about food, cooking, and living a balanced life. We believe in quality craftsmanship and work with the best materials to get the desired results. We sell the best for exactly the price it should cost. It’s the very simple system at the heart of everything we make. UL LISTED All of our Wood Fired Pizza Ovens are professionally and rigorously tested under strict UL standards to provide you with the highest performing and safe cooking equipments. 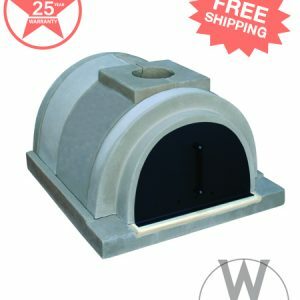 FREE SHIPPING Our Wood Fired Pizza Ovens are shipped directly to our customers from our factory in California for free! Ovens shipped out of California will not be charged sales tax. Our ovens ship via LTL (Less Than a Load) carriers. Ovens are shipped on trucks with lift gates, for easy delivery to your home, construction site, or warehouse. All ovens are shipped on pallets and crated. Our Roma wood-fired oven offers big performance in a small Footprint. If all you want to do is cook the best-tasting pizza in a limited space, this oven is for you. Great for indoor installations with limited space, this professional grade wood-fired oven heats up fast to 900F in an hour or less. Cook authentic Neapolitan pizzas in 60-90 seconds. This oven takes up about as much space as a built-in wall oven. 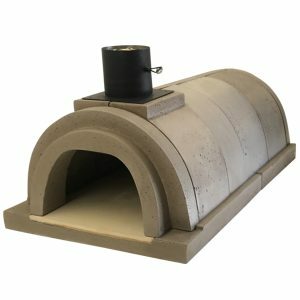 The Roma is based on the ancient ROMAN style tunnel ovens and has a footprint of only 30″ square, perfect for 2 – 8 ” pizzas or 1 -12″ pizzas. Want to make loafs of bread? No problem, This authentic wood-fired oven will give superb results. It can be installed easily indoors and will fit most countertops. 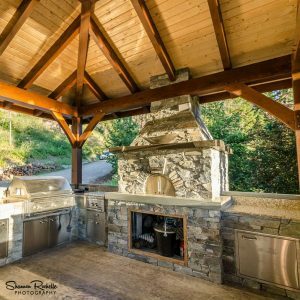 If you don’t have a wood-burning pizza oven in your home or outdoor kitchen… what are you waiting for? If you are looking for a real wood stone oven look no further. Our Milano professional wood fired oven kit will perform exceptionally well under the most demanding conditions, whether you install it indoors or out, at home or in your restaurant. All our ovens have the perfect parabolic shape and exact dome to door cavity ratio. Our traditional arch door opening creates a strikingly beautiful design. Wildwood’s Milano wood fired oven kit is designed and manufactured for high performance. 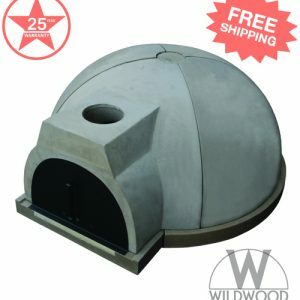 Wildwood makes it easy to build your own pizza oven. 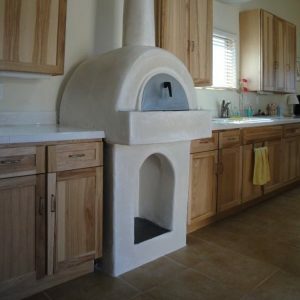 You know longer have to waste valuable time sorting through brick pizza oven plans, or looking for a competent builder. Many homeowners install our ovens themselves. We offer the perfect DIY solution. Want a pre-assembled oven? We have you covered! Contact us to discuss how we can make your plug and play oven that is as unique as you! Wildwood’s Toscano wood fired oven is a professional grade oven of incomparable quality and performance. This oven is the perfect choice for home or restaurant use. 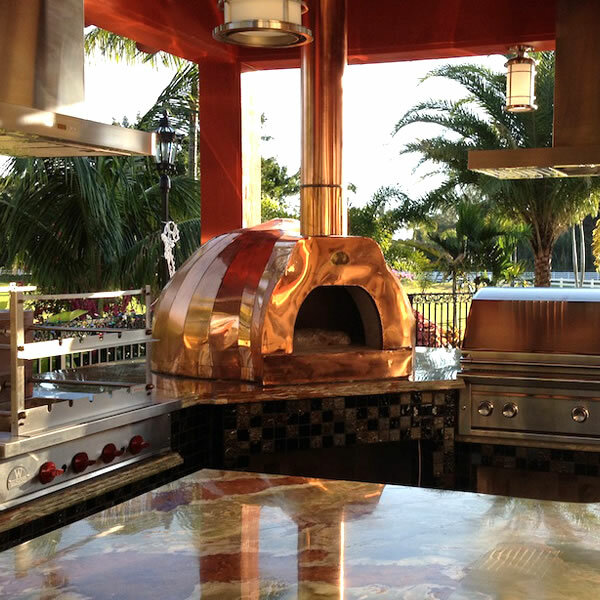 Certified for indoor or outdoor installation, you can be sure that our oven will enhance your culinary lifestyle. Our method of modular pizza oven construction has been proven over years of use. Since 2002 Wildwood has thousands of pizza oven construction projects completed, we are experts in our field. 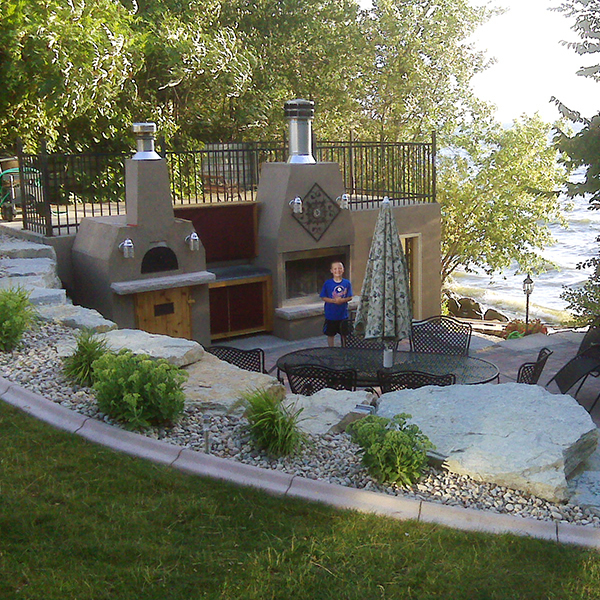 Check out our image gallery to see some of the beautiful pizza oven designs. The Wildwood Toscano is our largest wood burning pizza oven. This oven has a large capacity. It will bake five 7 inch pizzas at a time. Pizzas bake in 60 to 90 seconds.